Computer Market Research designed an Opportunity Management module as a convenient solution for channel partners to register their deals with ease and simplicity. By filling out an online form and clicking the submit tab, a process that typically takes you and your partners, distributors and/or resellers days, can now take less than 5 minutes to complete. The system itself manages the ‘approval’, ‘reply notification’, and ‘closure incentives’ processes. Partners fill out an Opportunity Management form with your company’s brand and are not allowed to submit the form unless all required fields are completed. When a new opportunity is submitted for review, you receive an automatic email alert. You can review, approve, decline or ask for more details about the opportunity in real-time, and track the entire process online. Based on your specific program design, opportunities are routed to the appropriate recipients. Eliminates the need to update spreadsheets, make follow up calls, or ask for status via e-mail. 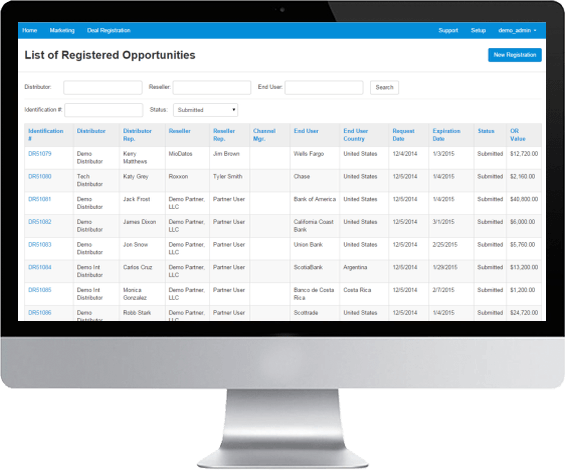 Capture critical sales data from point A to Z during the entire opportunity process. Identify and solve potential channel sales and channel marketing problems early in their respective cycles. If you are traveling, you can easily log into the application using the Web. Data is always current and available to view via secured log-in.